The News of the World is closing amid a major scandal over phone hacking and alleged payments to police officers, but once upon a time journalists went even further to get the ultimate story, writes Neil Root. There was a time when everything and anything was done in pursuit of the perfect crime news story. The allegations being made about dubious journalistic practices at the News of the World are shocking and immoral if proven to be true. But the current row takes us back to the 1940s and 1950s when hacks on that very same tabloid and other papers were just as clandestine in their methods, and with even fewer legal restrictions. In the years after World War II, the print media's response to the horrific crimes of three of the most infamous killers in the annals of British crime whipped up an almost identical furore. The three serial killers Neville Heath, a "charmer" who murdered two or possibly three women; John George Haigh, who murdered at least six people and disposed of their bodies in acid; and John Christie, the monster of Rillington Place who killed seven or eight people and watched Timothy Evans hang for one of those murders. These dangerous men were made into macabre pin-ups by the popular press of the time, the immediately post-war world where London and other cities were cratered and scarred by Hitler's bombs. The practices of two legendary Fleet Street crime reporters - Norman "Jock" Rae of the News of the World and Harry Procter of the Mail and later the Sunday Pictorial - stand out from the rest of their peers. With the chequebooks of their editors in hand, these hardened and tenacious hacks chased down the stories of these murderers, and tried to get them at any cost. These were the days when the News of the World sold more than 8 million copies every Sunday, and every effort was made to get a crime scoop, the more grisly the better. 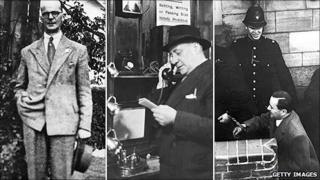 Rae and Procter were highly regarded by their editors, as their crime stories produced great spikes in circulation. When a rival paper bought a helicopter to get to stories faster in the late 1940s, Procter's editor said: "They may have a helicopter, but we've got a Harry Procter." Fleet Street's crime reporters were star journalists then, and became known as the Murder Gang, with incredible contacts amongst the police, judiciary and legal system. Payments were made without a second thought, and papers such as the News of the World and the Sunday Pictorial got the best inside morsels of information, as the Sunday papers paid more than the dailies. Incredibly, these hacks got the full inside stories on Heath, Haigh and Christie, and in return paid their legal defence costs - in two cases, they made substantial payments to the families of two of the killers after they were executed. Sunday's crime confession scoops were always tomorrow's fish and chip paper, but copies were sold on the day, and that was all that was important. Today laws and media regulations prevent criminals profiting from their crimes, but in 1946-53, there were no such restrictions (although one rival editor did go to prison for contempt of court). "The wife is already asleep in the armchair, and the children have been sent out for a nice long walk," wrote George Orwell. "You put your feet up on the sofa, settle your spectacles on your nose, and open the News of the World." And what will you read? "Naturally, about a murder." Orwell described Sunday afternoons spent devouring reports of heinous slayings as "blissful". But in his 1946 essay Decline of the English Murder, he feared that lurid crime reporting had passed its peak. He lamented the demise of the "perfect" murder, which had been so common in the pre-war days. This would involve a "little man of the professional class" who risks losing his social standing by "cherishing a guilty passion for his secretary or the wife of a rival professional man". Such crimes - Dr Crippen's is held up as a prime example - "excite pity for both victim and murderer". But Orwell complained that wartime and postwar murders were tawdry by comparison, reflecting an age of "dance-halls, movie-palaces, cheap perfume, false names and stolen cars". Procter met Neville Heath on at least two occasions before Heath committed his first murder, and had face-to-face interviews with John George Haigh and John Christie before either was arrested or charged. Even murkier was the fact that Rae arranged to secretly meet with Christie to get his inside story for the News of the World while the serial killer was on the run - a time when every police force in Britain was on the lookout for him. This was an era when the disarray on the city streets, heavy rationing and the heavy hangover of the war was matched by the immoral practices of tabloid hacks driven to get results for their newspaper, and to do so at any cost. The current allegations surrounding the News of the World of phone-hacking and reporters' investigations into the families of murder and terrorism victims and slain soldiers can be seen in the light of the actions of hacks from 60 years ago. The world of dark celebrity, which Rae and the rest of the Murder Gang helped build, truly was the seed of the tabloid crime coverage we see around us today. The immense pressure on tabloid journalists to "push the envelope" and use every method necessary to get their scoop has not changed, as the current scandal shows. From the time that Rae and Procter were operating, and most probably long before, tabloid hacks have had to be flexible to the point of immorality to get the type of stories that made their paper fly off the stands. But the News of the World has not been the only culprit, and these are practices which have undoubtedly been systemic in the British tabloid world generally for decades. The drug bust in 1967 involving the Rolling Stones had tabloid media on the scene as fast as the police, prompting later suggestions of collusion. William Rees-Mogg wrote in his Times leader of the Rolling Stones drug bust: "Why break a butterfly on a wheel?" The situation now at the News of the World seems to be the straw that finally broke the tabloid camel's back. Frenzy! Heath, Haigh & Christie: The First Great Tabloid Murderers by Neil Root is published on 4 August.